So I’ve been taking part in a few laughable activities over the last few days. First a quiz. QUIZ: Which science fiction writer are you? I’m actually really flattered by this quiz result. 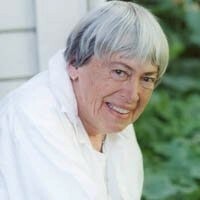 Ursula K. Le Guin has published twenty-one novels (including the Earthsea Series), eleven volumes of short stories, three collections of essays, twelve books for children, six volumes of poetry and four of translation, and has received many awards. I can only dream to one day say I’ve published as much. The second thing I wanted to bring your attention to is the Chinese Whisperings fan page on Facebook. Not only are the people on their crazy (yes I include myself in that statement) but they’ve started a chain story in the discussions forum. I encourage you all to head over a take a peek. As for submissions, I haven’t sent out any stories so far this year. My friends Jodi Cleghorn and Krista Ball were recently accepted into the 3rd Flash Fiction Challenge. Congrats to you two! I did not submit to the challenge this time around. I’ll send something out into the universe soon. When I do, you’ll be the first to know. Thanks Tina! An acceptance on Day 2 of becoming a full-time writer was a nice boost to the ego. I often recommend LeGuin to people who say they don't like science fiction. She's wonderful!